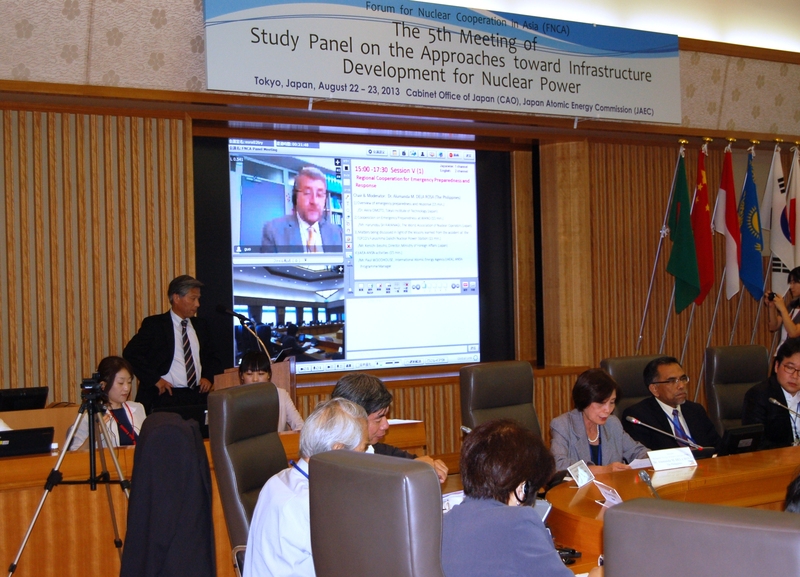 The 5th Meeting of "Study Panel on the Approaches toward Infrastructure Development for Nuclear Power" was held on August 22nd and 23rd, 2013, in Tokyo, Japan, hosted by Cabinet Office (CAO) and Japan Atomic Energy Commission (JAEC). The panel discussed on Small and Medium sized Reactor (SMR) development, the regional cooperation for Emergency Preparedness and Response (EPR), nuclear security and stakeholder involvement. The panel also shared information on the current status and future of Tokyo Electric Power Company's Fukushima Daiichi Nuclear Power Station and the efforts for safety improvement in Japan after the accident at the TEPCO's Fukushima Daiichi Nuclear Power Station. 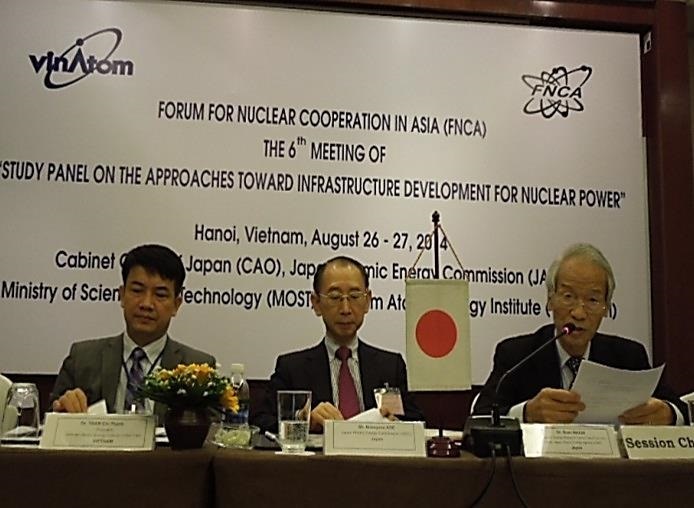 Member countries shared information and experiences on nuclear power in each session through the presentations delivered by Japanese experts and IAEA, and the discussions among the participants. The site visit to Fukushima Daiichi Nuclear Power Station was held on the day before the meeting in order that the relevant participants in member countries may well understand the approaches on the decommissioning that Japanese government and Tokyo Electric Power Company are currently curried out. The presentation from IAEA was delivered on the Web meeting between Japan and IAEA headquarter in Vienna which was the first trial at FNCA meetings. For the upcoming panel, the following candidate topics were suggested such as Post-Fukushima situation, SMR, stakeholder involvement, EPR and role of Technical Support Organization (TSO). Dr. Omoto proposed the draft summary of the panel and the provisional summary was adopted after modification along with the comments from the participants. It was agreed that the additional comments will be called and that will be reflected to the final edition. 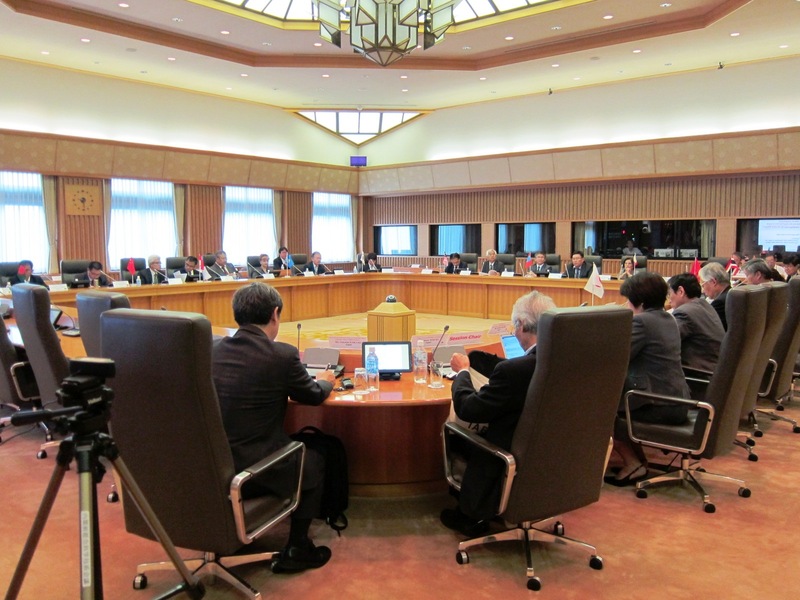 The AEC of Japan and Cabinet Office of Japan organized the 5th Meeting of the Study Panel for Nuclear Power of the FNCA in Tokyo on the 22-23 August, 2013 with the participation of 11 members of FNCA. Ten sessions covered a wide spectrum of key issues ranging from post-Fukushima status and actions (session II, III, V) with focus on new regulatory requirements and Emergency Preparedness and Response (EPR) to contemporary issues of Small- and Medium-sized Reactor (SMR) (session IV), nuclear security (session VI), stakeholder involvement (session VII) and others (session I, VIII, IX and X). The current status of Fukushima Daiichi NPS and the road map for the future actions of defueling and decommission was presented by the Japanese METI. It was reported that removal of Spent Fuel (SF) from SF storage pool will commence towards the end of 2013 and removal of debris will start from the end of 2021.
handling of SF. Japan said the estimate is around 10BUS$. The NRA considers there were two problems of nuclear regulation in pre-Fukushima era, namely a) not setting regulatory requirements for level 4 defense-in-depth but relying on voluntary actions of Operators and b) not formulating backfitting rule. METI (Ministry of Economy Trade and Industry) of Japan reported its new WG on self-regulatory actions by Operators, and JANSI (Japan Nuclear Safety Institute) explained two key activities for voluntary safety improvement including peer reviews. Prof. Omoto, chairperson of the Study Panel, in his lead speech, discussed opportunities (grid-appropriateness, local energy supply by supply of power and heat, incremental investment) and challenges (economics especially economics of scale vs. economics of series, technology, and institutional aspect) of SMR. Japan explained SMR-related activities by the OECD/NEA and Japanese SMR designs including two LWRs, sodium cooled 4S system and gas cooled reactor. GTHTR300 by JAEA is based on experiences of HTTR which achieved operation at 950 deg C and had gone thorough "inherent safety" test by stopping cooling pumps and without inserting control rod. China shared information of ACP100 (IPWR: integral type LWR) and HTR-PM (200MWe by 2 reactors and one steam turbine), the latter of which is under construction. RoK has been developing 100 MWe SMART-IPWR system, which is already licensed and waiting for funding. Kazakhstan is studying the use of SMR with Rosatom and JAEA. A panel on SMR discussed the viability of SMR at a time when nuclear has only 5-6% share of primary energy supply. It was pointed out that SMR could provide affordable reactor for non-OECD countries which have growing demand of energy and could enable use of nuclear reactor for purposes other than just producing electricity, e.g. use of hydrogen produced from HTGR by the transportation sector and industrial heat. Prof. Omoto, chairperson of the study panel, in his lead speech, discussed lessons learned and changes made in Japan in light of Fukushima accident including law, institution and zoning. He indicated potential areas of regional cooperation (notification, harmonization such as on zoning, sharing resources, regional drill, synergy with already-existent regional disaster management system). The Japanese MOFA (Ministry of Foreign Affairs) explained its initiative to enhance the IAEA-RANET activities including capacity building. RoK explained KAERI's environmental radioactivity studies including plume dispersion modeling activity. The Philippines listed some EPR-related activities in the regional such as the IAEA/ANSN project, the US-led GTRI project, proposed EU cooperative work and ASEANTOM. The IAEA explained the ANSN activities, which currently focus on capacity building under various topical groups including EPR. During the panel discussion it was agreed that FNCA and ANSN put into writing potential areas of regional cooperation for EPR and possible framework/vehicle to materialize the proposed action. Mr. Gregoric, consultant from Slovenia, former Section Head for prevention in the Office of Nuclear Security of the IAEA, gave a lecture on the global security framework, clarified responsibility of operator (within DBT) and that of the State (beyond DBT) based on threat assessment, and emphasized the importance of ratification of CPPNM amendment to upgrade international security level including criminalization of offenses. He also touched on IAEA NSS#13 alias INFCIRC225/Rev5 and the International convention for suppression of acts of nuclear terrorism (ICSANT), IAEA Code of conduct on the safety and security of radioactive sources, IAEA Nuclear Security Series, IAEA review services (INSServ, IPPAS). He suggested that if INFCIRC225 goes to Rev.6, it would include security by design in the same token as now safety by design and to some extent safeguards by design. 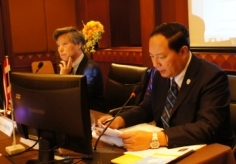 The JAEA shared information of capacity building activities in ISCN (Integrated Support Center for Nuclear Nonproliferation and Nuclear Security) which is currently providing three courses, namely nuclear security, safeguard and SSAC (Sate Accounting and Control of Nuclear material) and international non-proliferation framework. Since the start of its activity in 2011, the center has trained more than 1000 students. 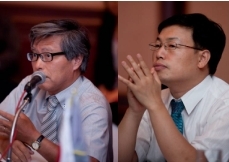 Since China and the RoK will be operating similar training centers on nuclear security and safeguards, the JAEA reported initial meetings among the three countries to coordinate and establish cooperative activities in the area of security training and development of academic programmes. Kazakhstan shared the information on the construction of security training center, which will start operation next year, and which will be open to other countries. The reason of delay of ratification of CPPNM amendment was discussed. The question was raised on cost addition by implementing security requirements. Both Mr. Gregoric and JAEA have similar view that it will be 1-3% of the total operating costs. The Session chairperson (Dr. Muhd Yunus of Malaysia) raised, in the same token as was discussed for EPR, an issue of regional cooperation including creating synergy and setting common goals, to be achieved in next 4 years, of nuclear security in the region by regional cooperation especially considering that four countries are providing training services. Dr. Machi, FNCA Coordinator of Japan, commented that the existing project of FNCA on safeguards and nuclear security would serve this purpose. Bangladesh said it needs support and monitoring from international communities and organizations, like; IAEA, FNCA, etc. on achieving security level before starting operation of nuclear power in Bangladesh. Dr. Machi, FNCA Coordinator of Japan, reported the results of recent opinion poll on nuclear power in Japan. The poll on nuclear power by NHK in March, 2013 shows that 25% to support the status quo, 40.5% to support the decrease of nuclear power and 27.6% to support the abolishment, which means 65.5% are supportive to the use nuclear power at least for the time being. The poll by Yomiuri Press in Feb. 2013 shows that the majority (51%) support the Abe administration's policy to revise the previous administration's nuclear policy to close nuclear power. Overall, Dr. Machi's message is that getting support of the public for restarting idle NPS is the important challenge. Ms. Akiba, Commissioner of AECJ, discussed the challenges of installing HLW disposal facility by referring to European (Sweden, Finland, Switzerland, France, UK) and Japanese cases. She emphasized the importance of face-to-face meeting (such as in Swedish kitchen table meeting) under consensus approach and the strategy of series of public meetings starting from meetings in a small administrative unit. She also analyzed the recent case of UK, where communication by local politician was not successful. Malaysia shared experience of difficulties of Rare Earth Oxide plant by underestimation of possible public opposition using both social media and public demonstration (against the use of slightly radioactive Lanthanide in the process), by the lack of strategic communication plan (taking approach of not disclosing information) etc, which eventually lead to loss of trust from stakeholders. Dr. Tatsuzaki of NIRS explained three training courses/materials provided by NIRS to medical staff (radiation emergency medicine, first response to radiological accident, e-learning on radiation), in addition to overview of courses on radiation emergency medicine provided by various organizations in Japan. He also shared experience at the time of Fukushima Daiichi accident of denial/hesitation among medical doctors/nurses/staffs of hospitals to receive contaminated patients, partly due to lack of knowledge. According to the Diet's accident investigation report, there were medical doctors and nurses at Fukushima Medical University Hospital, though accepted patients, who left the hospital out of fear of radiation from contaminated patients. The discussion on the next venue was suspended in connection with the selection of topics. Japan will continue the dialogue with candidate countries. "Study Panel on the Approaches toward Infrastructure Development for Nuclear Power"
Association "Nuclear Society of Kazakhstan"
International Atomic Energy Agency (IAEA), etc.